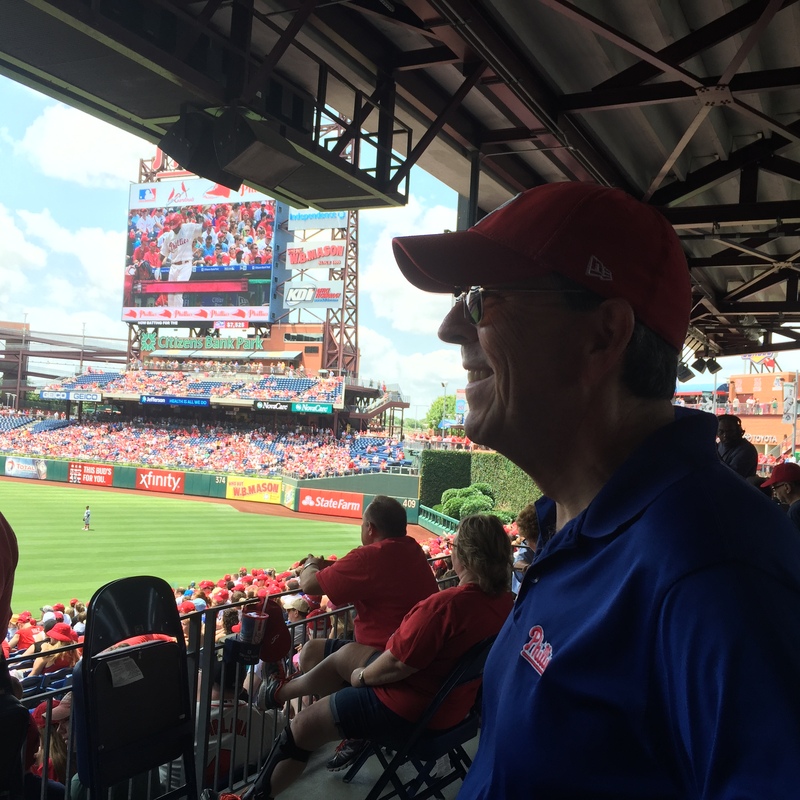 Phillies baseball was good again to the Nearys, as Father’s Day saw Kevin notch another victory in a disappointing season to date. Kevin, Christopher, Lindsey, Chris L. (nurse), and Joe (dad) were able to spend the weekend together and attend the game on Sunday. The weather, supposed to be stormy based on early week forecasts, turned sunny (It is, after all, Always Sunny in Philadelphia) and pleasantly breezy. It was a great day and the end to a great weekend as Kevin’s brother Chris and his girlfriend Lindsey came up to spend a couple days with him and to celebrate Fathers Day. 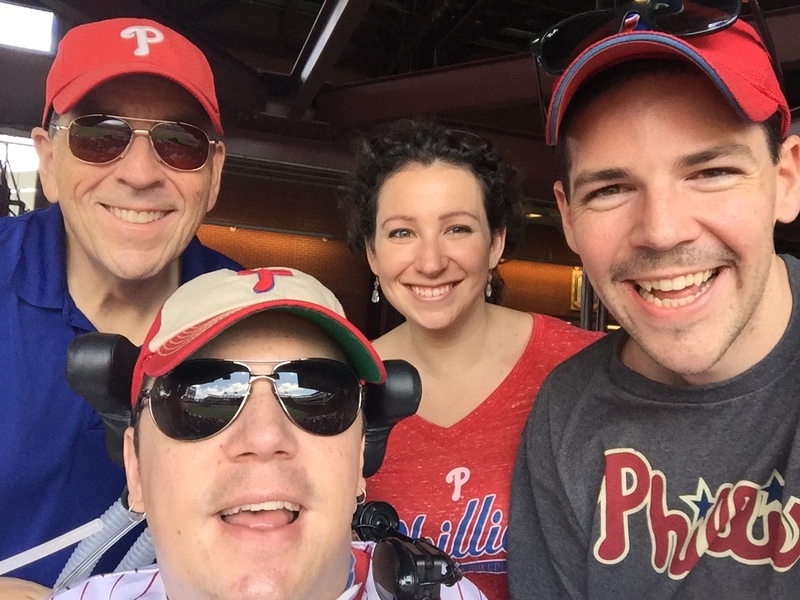 Coming up is another trip to the ballpark this Saturday as the Phillies will be taking on the Nationals on Saturday at 3:05, with an even bigger crew of Kevin’s fans. Kevin’s brother Joe (JP), fiancé Olivia, future in laws Stan and Kim Cotton, Joe and girlfriend Kathy Perkins, and nurse Chris L. all will be attending the game and sitting in section 104. If you are at the game, be sure to stop by to say hello to Kevin and to welcome to Philadelphia the newest members of the Neary family, the Cottons. Afterwards it’s back home and firing up the grill to celebrate a Phils win (hopefully) and Joseph and Olivia’s and Stan and Kim’s visit. We are skipping the game on Sunday so Kevin can spend time with his brother and future sister in law. Now, a word about the upcoming golf tournament. Next Saturday is July 4th which is only two months from the close of ticket sales for the tournament. Bill Burland has been pushing hard to sell out the tournament as early as possible and the results are impressive. As of today he has 65 golfers signed up which leaves only about 55 spots open, with commitments for about 40 more golfers. Please sign up as early as possible so we can make the necessary arrangements and, more importantly, so you don’t get shut out from a great event on a great course. We’ve got a really amazing Philadelphia Eagles donation to announce. But first, a quick update on Kevin and the Neary family! Kevin has been getting out more, thanks to the warmer weather. In particular, he’s been at Phillies home games recently. Stop by Sections 104 and 105 on Sundays, and you’re likely to find some Nearys there! Come by and say hi. Speaking of Philly sports: Got any plans for Sunday, October 11? Consider bidding on this fantastic Philadelphia Eagles package! It will be a live auction item at our September 21 golf event! The lucky winner of the Eagles package will enjoy four club level seats, pregame field passes and a parking pass to the Sunday, October 11, 1 p.m. game against the New Orleans Saints AND an autographed Malcolm Jenkins jersey. The pregame field passes, alone, provide a once in a lifetime opportunity for a fan! Just one example of what is shaping up to be an incredible line-up of auction items. We’ll post a final program just before the event. Not a golfer, and interested in bidding? This year we’re providing some bidding options so that everyone in the FOKN community has a chance to win. First, you could come just to the lunch, and have a chance to bid. It’s the best way to read the room and make sure you’re in on the action. Second, if you know someone who is going, consider asking her or him to serve as your bidding agent! And if you don’t know someone planning to attend but would like to bid, please contact Chris Neary (nearyc@gmail.com) who can serve as an honest broker for those not in attendance. And, all of our silent auction items have “buy it now” prices. Once the program is posted, the first person who agrees to buy an item at the “buy it now” price is the winner! The live auction items (and those ALREADY include this Eagles package, a fabulous Travel Advantage Network seven night stay, and four clubhouse passes to the 2016 Quicken Golf Tournament at Congressional Country Club) are targeted to those attending the golf tournament. We still seek golfers, sponsors, live auction items, silent auction items, and golfer gift bag items! We’re about half full in terms of golfers, so it’s important for you to set up your foursome soon! Questions, contributions about auction items? Contact Chris Kelly,kellyc51@comcast.net.